This year marks the fifth year of our annual Holiday Show and Sale, featuring a remarkable selection of handmade items by some of the Central Valley’s finest artists and craftsmen. With your purchase, not only can you fulfill some of your holiday giftgiving needs, but you will also be supporting local artists as well as our efforts to bring the highest quality arts to our community! This year, we are proud to feature works by the Main Gallery Artists, a group of local artists who frequently exhibit and market their works together. The Main Gallery Artists include some of our community’s most recognizable talents so make sure to visit the show early so as not to miss out of some incredible artworks. 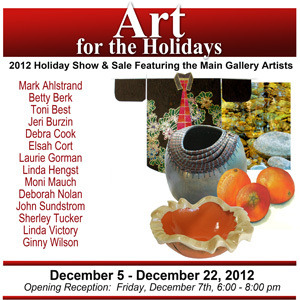 The Holiday Show & Sale will run from December 5th through December 22nd with an opening reception on the evening of Friday, December 7th. During the opening reception, Arts Visalia’s Board of Directors will hold our annual Holiday Raffle featuring over twenty wonderful prizes. Tickets may be purchased from one of our board members or directly at the gallery. You need not be in attendance to win, and all of the proceeds support our programs at Arts Visalia.